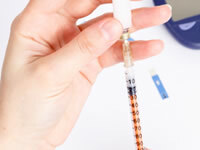 People with diabetes on insulin or certain tablets, such as solfonylureas, will have an increased risk of experiencing hypoglycemia. To be able to prevent hypos from occurring, it’s important to understand why you are experiencing low blood glucose levels. It is useful to find out whether there are patterns that could indicate why you might be going hypo. Do your blood sugar levels go low at similar times each day? Do you get hypos after particular activities? Do your hypos follow after periods of stress or illness? Do you get hypos in warmer or colder environments? If you find you go low at specific times of day, say just before lunch, you may want to change your routine to prevent the lows from happening. In this case you may be able to take lunch slightly earlier or have a small snack before lunch. Another option available would be to adjust your insulin. If you are not confident in adjusting your own insulin doses, speak to your diabetes team who will be able to help you. Certain activities can cause hypos to occur later in the day or even on the following day in some instances. If you take part in energetic exercise, this can cause us to be more sensitive to insulin for up to 48 hours. If you find you are getting hypos following specific activities, you can take action to prevent hypos occurring the next time. Remedial action may include reducing one or more insulin doses or taking carbohydrate prior to the times you’d expect to go hypo. For example, if playing football causes you to go hypo overnight, you might want to reduce your background insulin when you play football or take some carbohydrate before going to bed. Speak with diabetes team if you need help with adjusting your own insulin doses. When we experience stress or illness, we may need to take more insulin to help keep our blood glucose levels from going too high. When stress or infection is over, the body will revert back to its previous insulin requirements and this can mean a higher risk of hypos if we do not adjust insulin levels back to what they were before illness or stress. During periods of stress, it is recommended to test your blood glucose levels more often than usual. The University of Birmingham Medical School advises testing more often until your blood glucose levels stabilise. Many people report that their blood glucose levels are affected by significant changes in temperature. If you find your blood glucose levels vary in response to temperature changes, you may need to consider altering your insulin doses. If you keep records of blood glucose results, you may be able to detect whether any episodes of hypoglycemia may be linked with changes in temperature and take precautions to prevent hypos under similar conditions in the future.